Macau has so much to offer travelers of all ages, styles and budgets. This former Portuguese city reflects a mixture of cultural influences and is located just a short one-hour ferry ride from Hong Kong. Its giant casinos and malls on the Cotai Strip have earned Macau the nickname, Las Vegas of Asia. We really would have liked to spend more than just one day seeing what Macau has to offer. However, this article began because we only had one day to see all of Macau as we were at a trade show at the Venetian (in Macau). 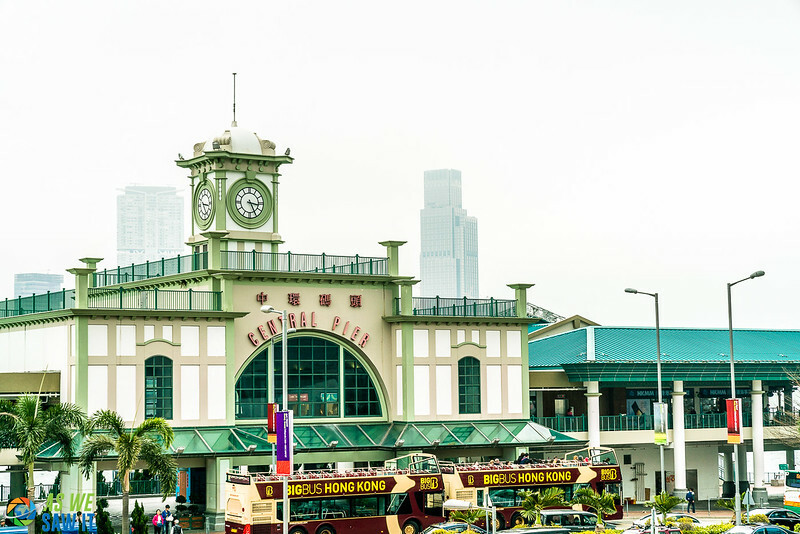 So we consulted with a friend (from HK) who told us how to do it as a day trip from Hong Kong! Realistically, unless you’re staying in Hong Kong longer than a week or two, it would be seriously difficult to justify going for more than just a day trip anyway. This Macau guide explains exactly how you can visit Macau from Hong Kong on your own, which is pretty easy to do. If you prefer, it's also easy to arrange a guided tour through Get Your Guide. For example, they offer this Macau Sightseeing Day Tour from Hong Kong, which and includes round-trip ferry transfers, transport in an air-conditioned sightseeing coach, and lunch at Macau Tower. Such a tour may be worth looking into if you’d like to avoid having to arrange everything for yourself, the benefit of having a tour guide, and visit most of the spots in our itinerary too. 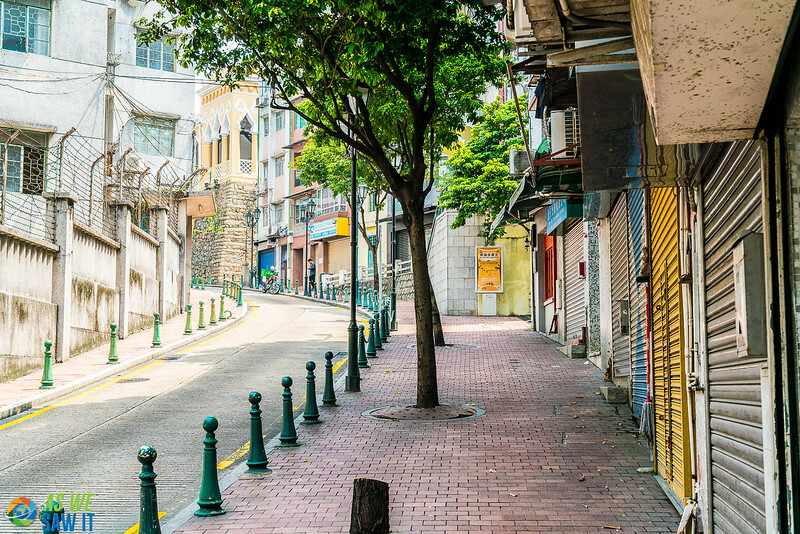 Before we jump into the exciting parts of our Macau day trip itinerary, there are a few planning details that we need to cover. We want you to be able to make the best decisions regarding your Hong Kong to Macau day trip. After reading this, you’ll have all the need-to-know information about visiting Macau for one day, from visa info and budgeting, to getting to Macau from Hong Kong and how to get around in Macau. Macau's climate is similar to Hong Kong's. Thus, they also share the same peak travel seasons. This is convenient, as it’s likely you’ll be visiting both destinations on your trip. What’s even more likely is that you’ll be hopping over to Macau for a day trip from Hong Kong. Macau's weather is generally warm and foggy in spring, hot and rainy in summer, cool and clear in autumn, and cold but sunny in winter. The best time to visit Macau is in autumn, from around the end of September to November, followed by spring (March to early May). Okay, this is possibly the most important part of your entire Macau day trip. If you forget these points, you may find that a day trip to Macau might unfortunately not happen for you. Regardless to whether you will be traveling on your own or with a guided tour, you will need your passport to enter Macau and again to re-enter Hong Kong. You will need to fill out an Arrival Card when entering Macau, and again a Hong Kong Arrival card upon your return. If you have visa-free status (find out here), you are not required to complete an arrival card. Simply hand your passport to the immigration officer, who will run your passport through the system and generate a landing slip. This printed slip will include your details, as well as the duration you are permitted to stay in Macau. Keep this landing slip with you throughout your stay in Macau. Passport holders of Bangladesh, Nepal, Nigeria, Pakistan, Sri Lanka and Vietnam are required to obtain an entry visa before arriving in Macau. Macau has its own currency, the Pataca (MOP). You’ll find ATMs at the ferry stations, in case you would like to get some money out for small purchases (taxis, meals, etc.). Although everybody will most likely accept Hong Kong dollars, any change you receive back will naturally be in Patacas (MOP). Quick Note: Buses will not be able to give you any change. When it comes to budgeting for a day trip, it can be very difficult to give advice. Every traveler has a different travel taste and enjoys doing and seeing different things. Therefore, for this section, we’re just going to give you an average mid-range budget that you can add to and take away from as you please. So, how much money will you need in Macau? Well, the average daily cost for traveling in Macau is MOP 936 ($116). The average price of food for one person per day is around MOP 136 ($17). However, if you enjoy dining at traditional Portuguese or International cuisine restaurants then you should plan for MOP 200+ ($25+) per person. UNESCO World Heritage attractions in Macau are for the most part free to visit, while museums have small entrance fees depending on which one you go to. Entrance fees are usually around MOP 5-15 per person. 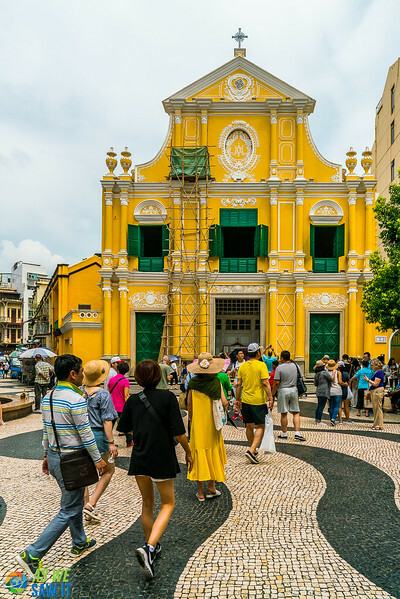 Do keep in mind that if you are joining a tour like this Macau World Heritage Excursion, your ferry cost, transport around Macau, Macau museum admission ticket and a buffet lunch will be covered in the price of the tour. Well worth it when you only have one day in Macau! Extra cost to keep in mind: Ferry prices are more expensive in the evenings and highest at night, over weekends and holidays. Getting to Macau is fairly easy and convenient, especially with the Macau ferries and China's new mega-bridge from Hong Kong to Macau. Some people even fly from Hong Kong to Macau via helicopter too, which is rather costly – but only takes 15 min! This mega-bridge connecting Hong Kong, Macau and Zhuhai is finally complete – after 9 years of construction. While not just anyone can use the bridge, and you have to have a special permit to do so, there are buses that operate on this route. The bridge shuttle bus service, operating between the Hong Kong and Macau border control points, operates 24 hours a day at intervals of between and 5 and 30 minutes. Tip: The queues for these bridge shuttles can be extremely long. Try to get there really early. Getting to Macau via the ferry can be somewhat confusing, however, you don’t need to let the options and terminals confuse you. Macau ferries from Hong Kong depart from both Kowloon and Hong Kong Island and the journey takes around one hour. 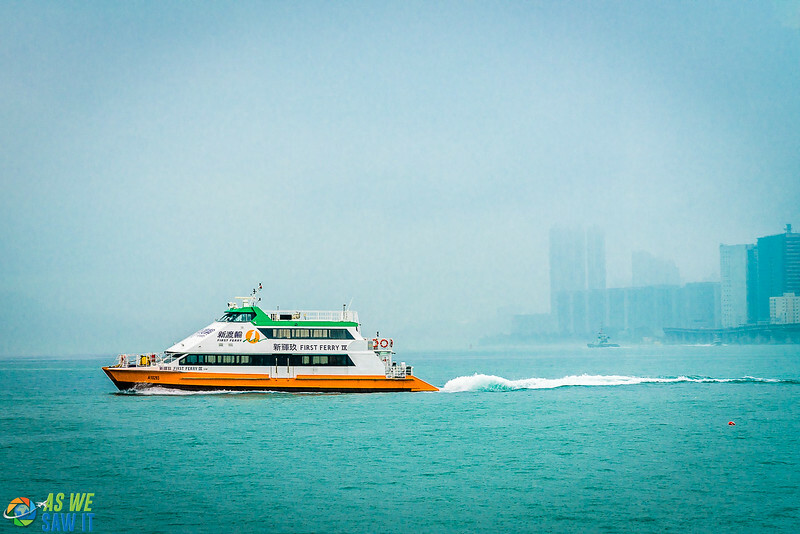 TurboJET offers ferry trips to Macau from Kowloon, as well as from Hong Kong (Sheung Wan). Cotai Waterjet is another company offering ferry trips to Macau from Kowloon, Hong Kong, as well as ferry trips to Macau from the SkyPier at Hong Kong International Airport. We suggest getting on the TurboJET (they depart at more regular intervals) and heading over to the Macau Outer Harbour Ferry Terminal. Tip: lick the above links to see the schedules, duration and prices of all the possible routes from Hong Kong to Macau. China Ferry Terminal is in Tsim Sha Tsui, and is about a kilometer north of the Tsim Sha Tsui Star Ferry. You can either walk there by walking through the Harbour City Mall, or you could catch take a taxi to 33 Canton Road. Hong Kong Macau Ferry Terminal is located near the IFC Towers in the Shun Tak Center on Hong Kong Island and can be found near the Sheung Wan MTR station. Sky Pier at the Hong Kong International Airport is strictly for transiting tourists only. Locals and people officially considered to have entered Hong Kong for immigration purposes may not make use of the Sky Pier. Traveling around in Macau is relatively easy and fairly inexpensive. Buses are plentiful, and you won’t struggle to find one. However, when using public buses, you need to know the routes (so plan these out ahead of time) and they can be very busy. Now for taxis, there does seem to be a problem during peak tourist season. Too few taxis means that you could end up spending long waits to find an available taxi. This is not ideal if you are in Macau for a day trip. From the ferry terminals, getting into town is really easy with public buses, which will take you to the main square in the center of Macau. From there, the Ruins of St. Paul are within walking distance. Keep reading for more on getting around in Macau! Tip: If your time is limited and you want a quickie tour, take the hop-on-hop-off bus in Macau. The entire loop takes 70 minutes, has a guided tour commentary, and you can remain on the bus and see the sights from there. Now for the one day in Macau itinerary you’ve been waiting for. 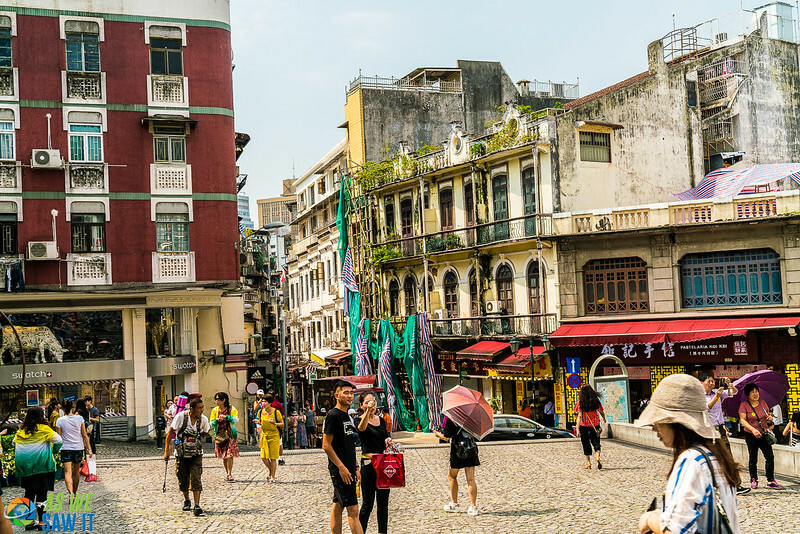 This guide has all the best of Macau squeezed into one day – so remember that time is of the essence! If you plan on visiting all of these places mentioned in this itinerary, then our advice would be to stick to this order so you don’t waste too much time getting from A to B. Remember that this is a day trip. It is supposed to be fun, so if you’re running out of time: stop, look around and enjoy your surroundings. After all, no matter where you are when you’re in Macau, you’ll still be in Macau! Our recommended Hong Kong to Macau day trip begins with catching the earliest TurboJET ferry from Kowloon at around 07:30 am. 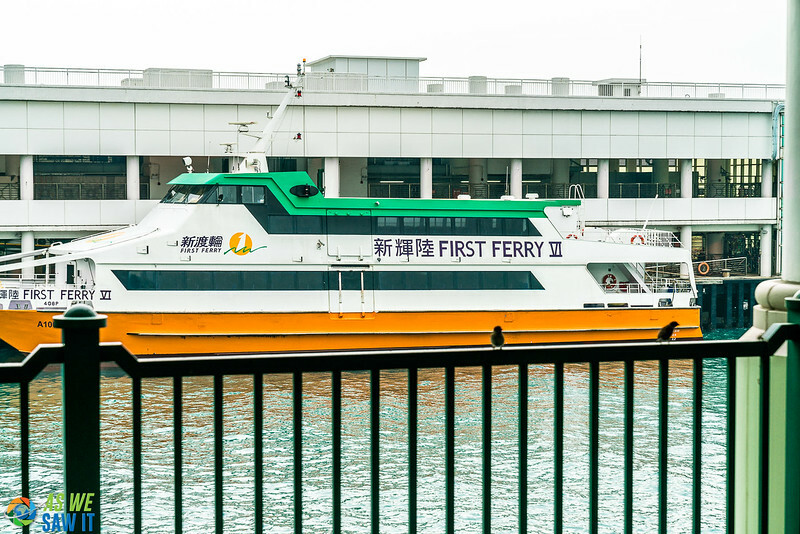 This ferry will arrive at Macau Outer Harbour Ferry Terminal. 08:30: Catch a free shuttle to Cotai Strip. Starting from Macau Outer Harbour Ferry Terminal, catch one of the free shuttle buses transporting guests to the big hotels on the Cotai Strip (a strip of hotel-casinos). From there, you’ll be catching either a taxi, or bus (the bus stop is in front of the Parisian Macau Eiffel Tower) to Coloane (Coloane Village – 2, Macau). If you’re catching the bus, then bus 25 will get you there. 09:30: Get out at the circle and explore Coloane. Here you will find Eduardo Marques Square, a rectangle paved in black, white and yellow cobblestones, laid out in a wave-like pattern reminiscent of the sea. At the end of the square, you’ll see the Chapel of St. Francis Xavier, built in 1928. This is definitely not something to be missed. Standing at the pillar with the chapel behind you will make for a stunning picture. This is the historic highlight of Coloane Village! Once you’ve taken in all the beauty and snapped up all your photographs, look for something yummy to eat as a little breakfast-boost. Our suggestion? Some egg tarts and a coffee – to go! From Coloane Village, either take a taxi (this would be the fastest option, as the bus takes more than double as long) or the bus to Taipa Village. Bus number 25 or 50 will get you there. This is a really nice place to take your time to stroll, let your eyes wander and take in all the unique smells. If you’re hungry, this is a great place to refuel! There’s a variety of food – from the authentic Macanese cuisine, to Portuguese cuisine, to Thai, Korean and even Japanese restaurants too. There are also various little shops selling Macanese souvenirs. P.S. 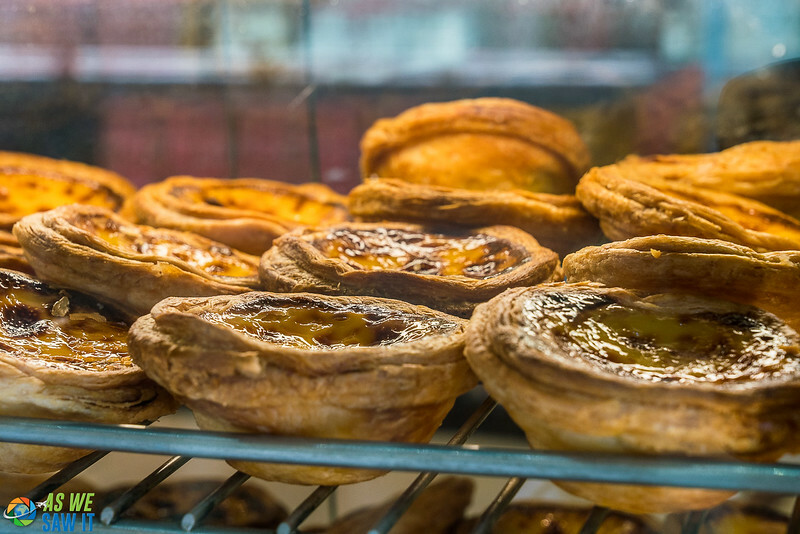 Stop in at Lord Stow’s Bakery for some delicious almond cookies and, if you haven't yet experienced them, try some Portuguese egg tarts. They were absolutely delicious! 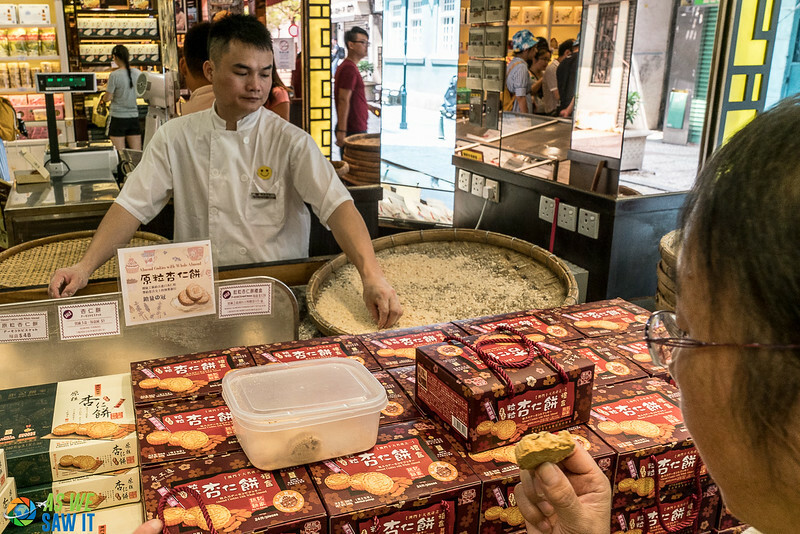 Almond cookies are a Macau specialty actually, so a must-try for sure! 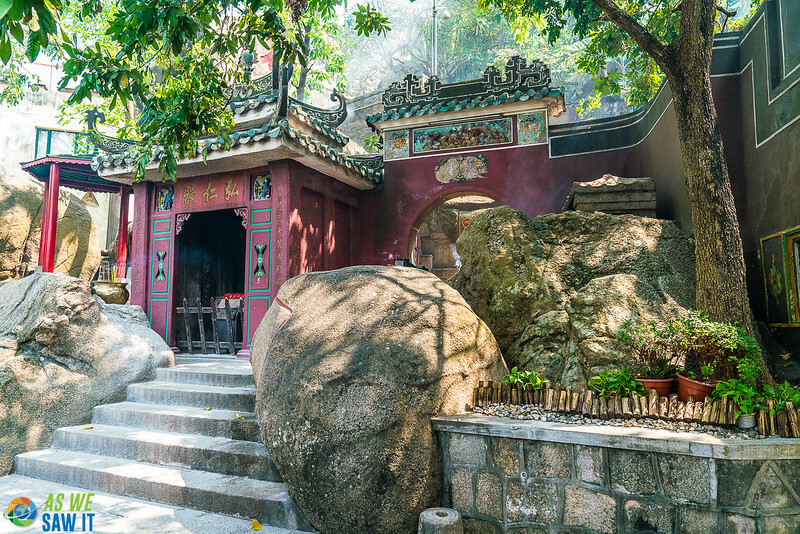 Jump on the bus (number 18) and it will take you to the beautiful UNESCO World Heritage site, A-Ma temple. Today, it still functions as a spiritual beacon in Macau and has centuries of history behind it. It was built around the late 14th century by the fishermen of the area. The temple is not very big, making it possible to walk around in less than an hour and see everything. This pretty temple next to the ocean also makes for some fantastic photo opportunities if you’re into photography. They burn a lot of incenses here and there are some beautiful details to observe inside. 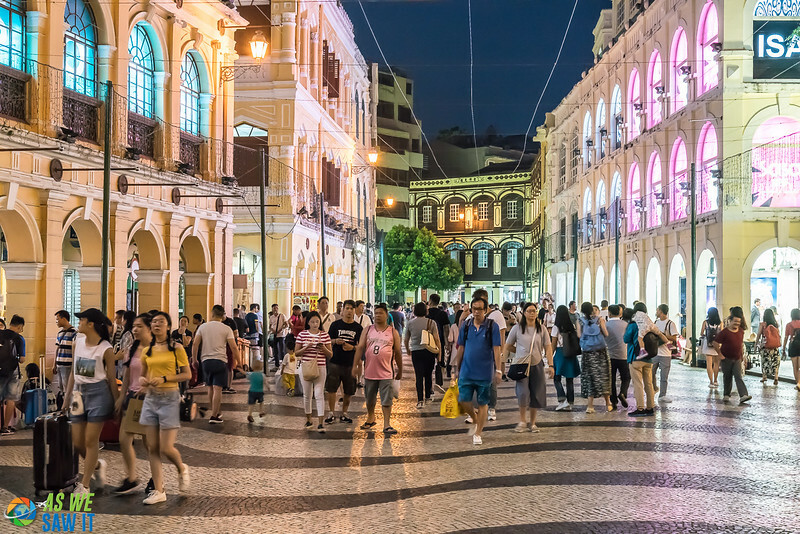 Being one of the main attractions in Macau, you can expect a fair amount of other tourists (depending on the time of year you’ve chosen to go). Optional extra to work in here: Macao Maritime Museum is next to the A-Ma Temple. The main building of the Macau Maritime Museum is a three-story white building, designed in the shape of a boat in full sail. This museum is divided into 5 sections, ranging from an exhibition dedicated to fishermen to an aquarium gallery. So if you are really into museums, culture, geographical discoveries and the beauty of the ocean – you won’t want to miss this one! Once you’ve seen all that the A-Ma Temple and its surroundings has to offer, it's time to get ready for a walk of a lifetime. Now, we’d just like to forewarn you that this walk is uphill, so you will definitely be burning some of the calories you just ate! Strolling from Senado Square to the A-Ma Temple could be done in less than a half hour. However, we go in the opposite direction on our itinerary, so it is a slightly longer and slightly more intense uphill walk. Doing it this way allows for more time at Senado Square shopping and sightseeing. The walk follows narrow quirky alleys lined with flowers and takes you past various sights, each one worth pausing for. Barra Square, the square in front of A-Ma Temple and the Maritime Museum, is where the first group of Portuguese explorers landed in Macau. St Augustine Church and the other historic buildings around StAugustine's Square (Largo de Santo Agostinho): St Josephs Seminary and Church, Dom Pedro V Theatre and Sir Robert Ho Tung Library. Mandarin's House (Casa Do Mandarim), links modern-day Macau and its historical beginnings. This is the largest family residential complex still standing in Macau. Its interior has been kept just the way it was hundreds of years ago, and even the furniture in some rooms has remained untouched, offering visitors a real insight into the way people used to live in the past. Lilau Square, a peaceful, nearby place to sit and relax. This was the site of the first Portuguese residential quarter in Macau and the surrounding buildings are Chinese Portuguese and even Art Deco style. The fountain here was the first source of spring water found in Macau. Go ahead, have a sip. There is a a local saying that ‘one who drinks from Lilau will never forget Macau'. Moorish Barracks, a Moghul-style building built to house an Indian regiment brought over to reinforce the Macao police force during the colonial period. The mustard walls and arches are quite beautiful. Tip: If it’s too rainy or cold, buses 7 and 11 will take you from A-ma Temple to Senado Square. Your uphill walk may be shorter or longer depending on how many stops you make along the way. Fashion clothes, famous snacks and a wonderfully scenic environment make Senado Square a famous attraction in Macau. Firework displays, as well as lion and dragon dances, are usually held on special days such as Chinese New Year (in February). People from all over the world come here to admire the famous wave-like mosaic-tiled pavement and colonial facades of the surrounding buildings. Around the Square, there are other attractions, so you will want to set aside a little extra time to figure out what exactly you’d like to see. 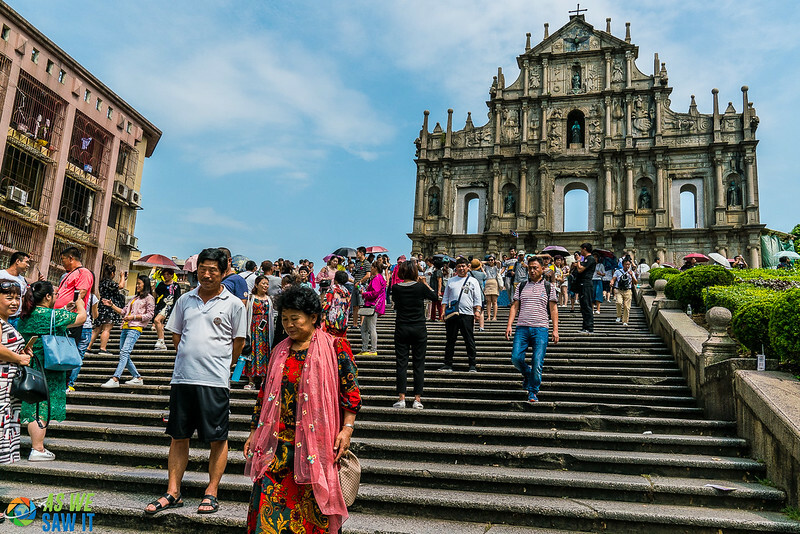 To one side of the square, you will see the Macau Cathedral, and at the end of the paved road, there is the St. Dominic's Church – well worth experiencing. On the third floor of the church, there is a museum of paintings, sculptures and liturgical ornaments that illustrate the history of the Roman Catholic Church in Asia. A 10 min walk from St. Dominic’s Church, and you will find the Ruins of St Paul. The front façade and the grand stone stairs are all that remains of what was once the greatest church in Macau. As you’ll see from the many tourists on the step, there are loads of beautiful photo opportunities at this stop. A short 5 min walk from the Ruins of St Paul and you will reach the Museum of Macau. This is a must-see if you only want to do one museum stop on your Macau day trip. The Museum of Macau is the biggest museum in Macau, and is located atop the famous Fortaleza do Monte (Monte Fortress), in the heart of the city. 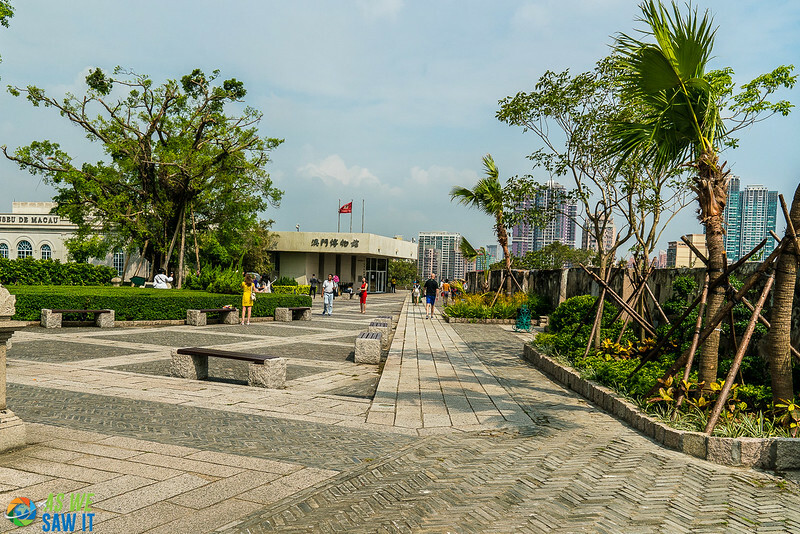 This museum consists of three floors of exhibitions, classified into different groups: original civilization, 1st floor; popular art and traditional culture, 2nd floor and contemporary Macau, 3rd floor. 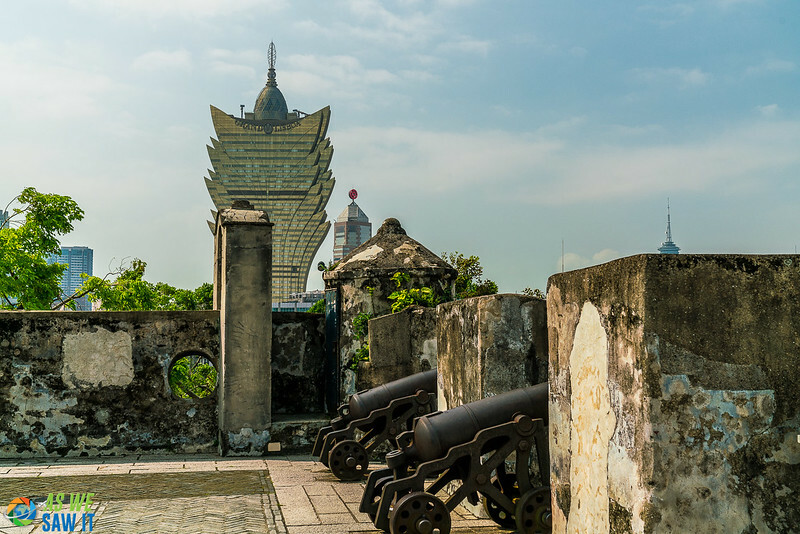 After visiting the Museum of Macau, you can go for a walk on the fortress' walls, and get a fabulous view over the whole city. Be sure to check within the fortress itself too, because there is also an underground vault with a permanent history exhibit. Jump on bus 26A, 25, 22 or 33 and travel about an hour to get to the famous Venetian Hotel. Or just hop into a taxi and just tell them the name of the hotel. Everyone knows where the Venetian is. The Venetian Macao is the largest casino in the world (546,000 square feet) and the second-largest building in the world. It also has 800 gambling tables and 3,400 slot machines. Walk through this magnificent hotel, look up in some of the rooms and admire the stunning gold, black and red ceilings. It’s really stunning. If you don't want to do any gambling, then go check out the massive Grand Canal Shoppes area. Even if you’re not a shopper, it’s another great option. Tip: While it may not be the real thing, as in Venice, you are also able to relax on a gondola on a 15-minute trip as you are serenaded by the gondoliers. Visit their website for updated prices and times of the gondola trips. If you’re up for a meal, there are so many options at the hotel to choose from, from Michelin Star restaurants to a food court, you will find something that suits your budget. You’ll have the option to savor all kinds of exquisite cuisines and have a unique dining experience at any of their signature restaurants too. The rest of the night is up to you, and there are many beautiful things to see – even just walking along the Cotai Strip at night is a lovely experience with all the beautiful lights. The options for the rest of your evening are endless. The City of Dreams hosts The House of Dancing Water, an award-winning theatre production by director Franco Dragone, that features acrobats, gymnasts, dancers, divers, and actors. We had heard so much about this really fantastic show. It is a must-see experience that you’ll want to relive over and over again. It’s definitely worth the HK$ 598 (at the cheapest) for a ticket. The show starts at 8pm (or 5pm) sharp, and no late entry to the show is allowed. Unless you are staying overnight (we have a recommendation for that below), your time in Macau is, unfortunately, coming to an end. After the show, you can to head over to the ferry pier where you can catch your ferry home if you don’t plan on doing any further exploring Macau by night. The option to try your luck in some of the casinos before heading back to Hong Kong is naturally there too – being in the Las Vegas of The East. Note: Remember that the ferry prices at night are more expensive than they are during the day. If you find yourself just not able to fit every single thing comfortably into one neat little day trip (like us!) – then staying one night in Macau adds an element that you just won’t experience on a day trip where you leave straight after the show: The night life. Macau comes alive at night. We stayed at the Parisian, a very centrally located hotel in Cotai, Macau. The Parisian has a luxurious shopping mall, an outdoor pool and even a water park. Just like the hotels along the Las Vegas Strip, it’s over-the-top extravagant. The French-themed hotel also has a half-sized replica of the iconic Eiffel Tower, which is breathtakingly beautiful even if you have gone all the way to Paris to see the real thing. Tip: The Parisian is connected to the Venetian Hotel. If you’re a gambler, you may already know that the Venetian is home to the largest casino in the world. It's also a prime trade show venue, which is why we were there. But we stayed at the Parisian; it's more budget-friendly. Our day trip to Macau was absolutely amazing and we’d recommend it to anyone traveling to Hong Kong. 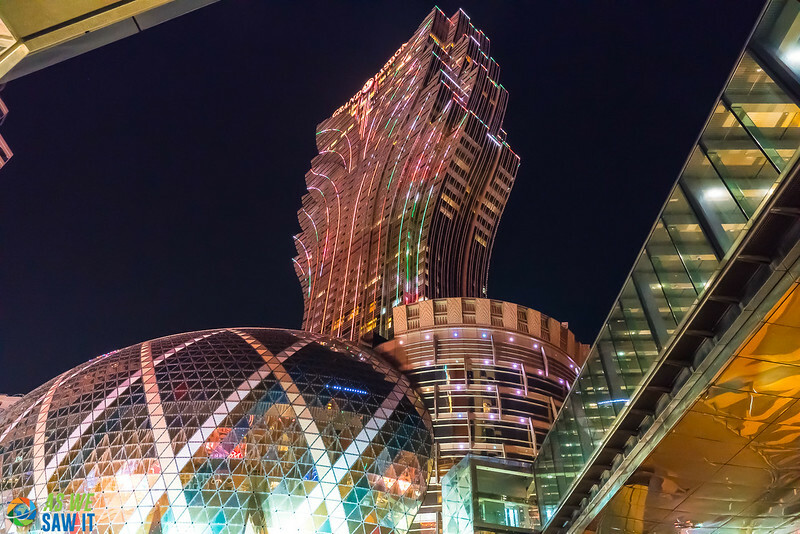 If you were unsure of what to do in Macau in one day, then we hope that this itinerary will guide you in the right direction! Obviously, Macau has so many things to do, and we really did only experience a handful! So if you’re wanting to swap out a few sights here and there, or maybe you’ll be in Macau longer than just a day (lucky you! ), here are a few more things to do in Macau – if only we could fit it all into our one day in Macau! The city where east meets west … Vegas of the east … millions of hours (and money too) taking your chances at slots or a game of Roulette or Blackjack. For many people, that’s Macau. Whatever your opinion of gambling, let's not pretend it doesn’t exist. Gambling in Macau is just like gambling in Las Vegas: it's almost synonymous. First-time visitors may feel overwhelmed by so many casinos, and even the many casinos along the strip can be quite daunting. While the minimum amount to play is different at each casino, there is always something to fit everyone’s budget. A great time to do this is when you’re near Taipa Village, either catch a taxi or the bus to the Macau Tower (bus number 11, 26, 32 and 33 should get you there). Macau Tower is a 338m high tower built by Gordon Moller, and is definitely worth a couple of pictures! Here you can go all the way up to the top and enjoy an amazing 360° view from the level 58 observation lounge, or you could opt for an outdoor skywalk? Or a bungee jump from the tower? To book a skip-the-line admission ticket to the Observation Lounge on Level 58, and the Outdoor Observation Deck on Level 61 – with access to the telescope! Tip: Entrance to the Macau Tower will cost you around MOP 165. Check their website for updated prices and other activities they have going on. If you love taking pictures, then this place is a lovely place to take a stroll. For the abandoned or urban explorer, then this location will also appeal to you. Built in the style of Ancient Rome and the Colosseum, the architecture is quite lovely. There isn’t much to do here besides restaurants, some shopping and an amazing sea view, but if you are in Macau and you have some extra time, it’s definitely a spot worth checking out. A trip to the Macau Science Center is a great way to spend an hour or two, especially if you have kids. They have a program filled with activities and exhibitions (the exhibit area is free to enter. There is also a planetarium at the Macau Science Center. Put on your special glasses, and you will see stereoscopic images projected on the giant dome screen that surrounds you. The Planetarium allows you to freely shuttle through the stars of the universe. We’re listing these two attractions together because they are located in the same space. Fortaleza do Monte is Macau’s historic military and defense structure. It was constructed between 1617 and 1626, and an interesting World Heritage attraction to visit in Macau if you have the time. The grounds of the fort showcase ruins of scattered buildings and you’ll find some amazing views of the city from the top. The Macau Museum is all about the history and culture of Macao. It holds a vast number of objects of historical and cultural value that display how the island’s various communities have lived over the centuries. This will make for a lovely little trip too, and is perfect if you have a little time left after visiting the St. Paul Ruins, as the two are within walking distance from each other. Halfway up, there is a bench where you can observe the beautiful view of the connecting Hong Kong bridge and sea. Once you reach the top, you will see the anchor, fortress and lighthouse. Head behind the lighthouse and find another beautiful spot to appreciate the view! Do you have a little spare time before catching the ferry back to Hong Kong? Or maybe you’ve decided to stay overnight? Either way, with this night bus tour, you get a comprehensive night view of the Las Vegas of East. You go all the way from the old town to the new town in just 50 minutes. If you are lucky enough, you can also catch the Performance Lake water show at Wynn Macau. If you are in Hong Kong and you’re looking for a day trip, then Macau is the trip to do for sure! Macau island from Hong Kong would make for a fantastic day trip and a day well spent. As you know, we were in Macau for a few days. Unfortunately, we only had one day to explore it. For those of you who don’t want to deal with details, we won’t judge you. There are some really great guided tours that will sort everything out for you. Leaving you with only one worry: did I charge my camera?? Here are some useful links to help you plan your own trip. Tourism authority: Macau’s tourism website has many useful trip planning resources. The code for Macau International Airport is MFM. Ferry from Hong Kong. To skip lines and avoid stress, book your Cotai Water Jet Ticket online. Ferry terminal to hotel. From the ferry terminals, getting into town is really easy with public buses, which will take you to the main square in the center of Macau. Visas. This wbsite has an easy-to-use tool that will tell you if you are eligible for Visa on Arrival (VOA). Currency. We use XE to calculate currency exchange values. Travel insurance. Trust us, when an airline misplaces both your suitcases for a week, you'll be glad you have it. Learn more here. You’ll be surprised at how cheap it is and how much it covers. Staying overnight might be a nice tweak to the day trip you’re planning. You know, just to fit in one more egg tart before heading back to Hong Kong to continue your holiday? We stayed at the Parisian for a trade show, but it doesn’t fit everyone’s travel style. We recommend using this website to make your lodging arrangements. Compare prices, amenities, and ratings before you book. Easy. Guided tours can be a great option, whether you want a local to show you around, or you’d prefer to have someone else manage all the arrangements. G Adventures offers insanely affordable small group tours on all 7 continents, with 100% guaranteed departures, even if you’re the only traveler. Expect local accommodation, cuisine, and transport to connect you with the planet’s people, cultures, landscapes and wildlife. Click here to check out their itineraries. When we travel, we use Get Your Guide a lot. It’s our go-to for food tours, attractions and activities. Click here to see what’s available in Macau. Want to see more of this destination? 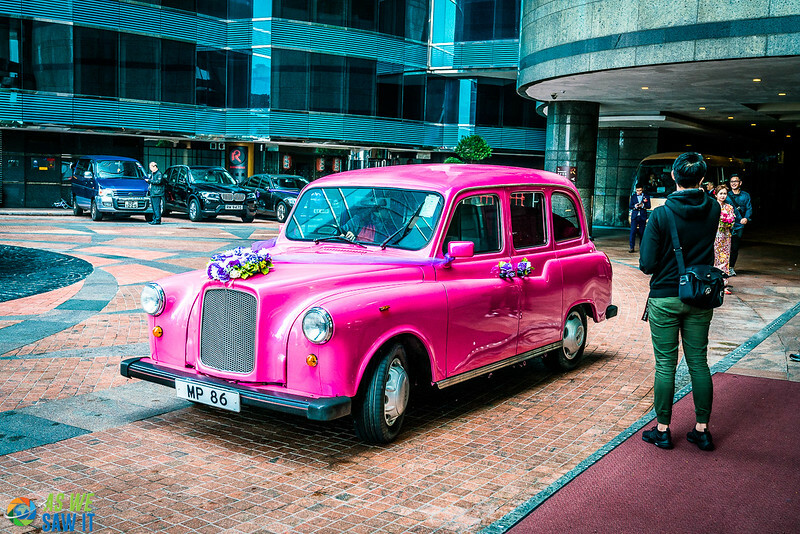 For more sightseeing, check out our Macau photo gallery.